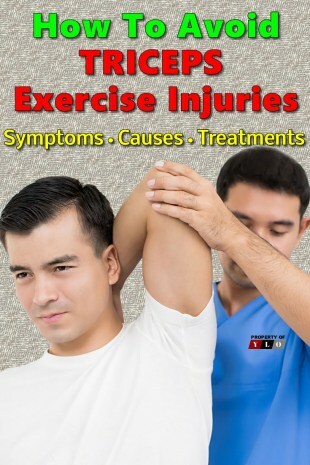 You need to know how to avoid triceps exercise injuries and other major muscle traumas. Overuse of your muscle groups is the leading cause of injuries in sports and exercising. These traumas can bench you and literally stop your fitness routines until you are fully recuperated. Whether we are already exercising faithfully to stay in shape, or our only exercise is lifting the TV remote or a fork, we know we need to take care of our bodies. In our hurried world, we skip resting or we do way too much early on. We either quit or we injure ourselves and can’t carry on. Repetitive injuries often occur in workouts and sports that require the same motions over and over. Studies have shown that overuse causes up to 30% of all sports-related injuries. Conditions such as inflammation, stress fractures, and tendinitis are some of the most common. On the opposite end of the spectrum are acute injuries related to contact and fast-paced sports such as American football, soccer or rugby. However, even these sports can cause repetitive motion injuries. So all athletes need to be aware of how to protect themselves from overuse injuries. Let’s look more in-depth at some of these injuries and how you can protect yourself. The triceps brachii muscle is to straighten the elbow and a tear or strain of this muscle can be quite painful. Usually, overuse or too much weight is the cause of a triceps exercise injury. The most common indicator of an injury while performing a triceps exercise is the pain in the back of the arm and you know as soon as this occurs. This is not the type of problem that occurs over time. It is a more instantaneous occurrence. The pain will usually come on suddenly in the back part of the arm. Thankfully, this can be alleviated by resting and icing the area. This type of injury includes pain in the muscle where it attaches at the elbow or the shoulder and in the back of the upper arm You might also notice some bruising or swelling at the point of the strain. If you have trouble straightening the elbow when another person is holding tension on the arm, or it results in pain, it’s a good clue. Tenderness if you push on the muscle will help you find the exact point of the tear. You should ice this area as soon as possible. Triceps exercise injuries happen when the muscle is suddenly overstretched. There is instant pain and a popping sound occurs. While it is not a common injury it usually happens with weightlifters or sports athletes where there is a great deal of muscle use. For instance, a baseball pitcher or a football quarterback. The overuse and repetitive motion will weaken the muscle to the point that a strain or a tear occurs in the muscle fibers. The first and fastest relief is ice or cold therapy and should be administered as soon as possible. The worst pain of the injury is usually in the first 24 to 48 hours and the ice therapy should be continued until you are pain-free. After the pain subsides apply a support or compression bandage to immobilize the arm and help to reduce swelling. Try to exercise the elbow lightly over time to avoid stiffness. Once the pain has stopped, begin some light isometric exercise. The static exercises can be done without moving the elbow and will not cause further injury. After a time, when you are comfortable with your recuperation, begin light use of resistance bands. Only do as much as you can accomplish without pain. Pain is an indicator that you are trying to progress too quickly. 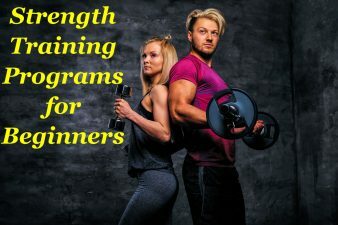 If there is no pain then begin adding more reps.
Do not try any other type of triceps exercise until you and your treatment professional are both satisfied that you are ready. This is the fastest and safest road back to the gym and the safest way to recover from a triceps exercise injury. This pain is felt in the front of the shoulder and can cause upper arm weakness. It is often a deep and throbbing pain caused or exacerbated by overhead repetitive motions. It occurs when the shoulders exercise is overdone. Weightlifting is a common cause, however, it is also seen in athletes that swim or play tennis and golf. Inflammation in the tendon that attaches your upper bicep muscle onto the bones of the shoulder is the source of the pain. 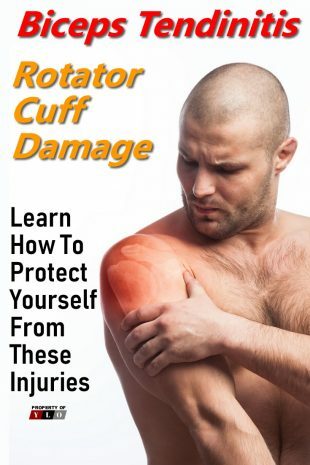 It can also be accompanied by impingement and rotator cuff damage according to experts. If you do have biceps tendinitis the recommended treatment is rest, ice, anti-inflammatories, physical therapy or steroid shots. Prevention: Vary your exercises and activities to prevent repetitive overhead motions. Also, allow plenty of rest time between shoulders exercise workouts. Proper posture also decreases your chance of tendinitis. The Rotator Cuff is made up of 4 large muscles and their job is to stabilize the shoulder joint. These muscles are the supraspinatus, teres minor, infraspinatus, and subscapularis. If you notice pain in your shoulder when you reach behind you, to the side or overhead during shoulders exercise workouts, it might be a rotator cuff injury. This is another injury often caused by repetitive overhead motions. Sports involving swimming or throwing an object such as a ball and exercises that require repeated overhead motions, like a military press, can lead to strains of the rotator cuff. Prevention: As a general rule if you strengthen your upper body, including the rotator cuff muscles mentioned earlier, it will help prevent repetitive motion injuries. You should also refrain from using too much weight when doing overhead shoulders exercise. Also, lat pull-down exercises should be done in front of the neck and not behind to lower the risk of injury. This is an injury that you will notice right away. It can occur in situations where you lose control of a weight, such as a barbell or a dumbbell and is a serious injury. It will cause a tearing sensation and bruising around the sight of the injury. You may see a change in the muscle indicating a tear or defect. You should be evaluated to determine if surgery is needed. Prevention: Choosing a lifting weight that you can control, or having a spotter on hand, is critical. A catching or locking sensation in your shoulder, combined with clicking sounds and pain during overhead exercises, may indicate you have a glenoid labrum tear. Your shoulder may seem unstable and have a limited range of motion. The cause can be trauma or repetitive motion. Orthopedic surgeons see many injuries that occurred during a fall when a person landed on their outstretched arm. Treatment ranges from pain management, combined with physical therapy, to surgery. You should seek medical care if an acute injury occurs or you have pain that does not resolve. Prevention: It can be hard to prevent a Glenoid Labrum Tear, but if you have the pain we have described avoid aggravating the symptoms and seek a diagnosis if it is unresolved. Small, hairline fractures can be the price of doing too much leg exercising early in your workout regimen. Most stress fractures occur in the shin, heal or foot. If you have pain that worsens with exercise or even standing, it is a possible sign of a stress fracture. It can also swell. Sports that require frequent changes in direction, like tennis or basketball, can be problematic. Osteoporosis is also a risk factor. Prevention: According to experts, begin exercise programs slowly and progress only 5 to at most 10 percent each week. For example, if you are jogging for one week and go 10 miles, the next week you should aim for 11 miles. Cross training is also advisable as well. Whether we were leg exercising or not, we have all experienced that moment when shooting pain travels up our leg and we realize we have twisted our ankle. High school and college athletes are subject to sprains at the rate of just less than one ankle sprain per 1,000 according to a study out of the University of Vermont. Athletes in sports that require jumping, or changing direction frequently, such as baseball, volleyball, football, and tennis tend to have higher rates of injury. If you do sprain your ankle you will want to be evaluated to determine the severity. Your ligament could be stretched, partially torn or completely detached and this will determine the treatment and length of time for recovery. Prevention: After an injury, when you are cleared to return to activity, you will want to wear an ankle brace to protect yourself for at least 6 months. It is also a good idea to add training exercises that focus on improving muscle control and balance. Pain down the inside of the tibia, otherwise known as the shin, is known as shin splints. Doctors often refer to it as medial tibial stress syndrome (MTSS). This bone runs down the front of your leg to your foot. It is common in runners and athletes that must start and stop or jump frequently. Basketball, tennis, running and soccer are problematic. You are at risk for shin splints when you begin a new or higher intensity workout, run on difficult surfaces like asphalt and uneven terrain or if you have ill-fitting shoes. Excess force on the legs can cause the muscles to swell and increase pressure on the bone. Experts warn that leg exercising injuries can happen quickly. Prevention: Start workouts slowly and increase intensity no more than 10 percent each week. Wear appropriate shoes that fit and have padded insoles. Stretch and warm up before exercising and strengthen calf muscles. You should also never exercise if you have symptoms of MTSS. Also known as “runners knee”, Patellofemoral Syndrome (PFS) is a very common diagnosis of knee pain that is chronic. It is thought to be caused by a misalignment between the femur (thigh bone) and patella (knee cap) which causes abnormal gliding and hence you feel pain. It can be aggravated by activity, especially descending or ascending motions like walking up or downhill or stairs. Leg exercising such as squats or even just standing and sitting can also be aggravating. In order to manage pain initially ice the knee and use anti-inflammatory drugs. This can very be helpful. Prevention: Avoid activities that require repetitive motions such as kneeling or squatting repeatedly. Exercises such as leg-raises and strengthening quadriceps and hip flexors can help. This injury, also known as iliotibial band syndrome (ITBS) is common in cyclists and runners and is another overuse injury. The pain is felt on the outside of the knee and occurs when the IT band that runs up the thigh from the shin to the hip becomes inflamed and tight. Cycling and running, either on uneven or sloped surfaces and with ill-fitting shoes, poses a risk. Running too far can also cause an overuse injury. Prevention: Cyclists can ensure that their seat height is appropriately adjusted. It can be helpful to find an expert such as at a bicycle shop or cycling class to help you decide on the proper reach for your legs. 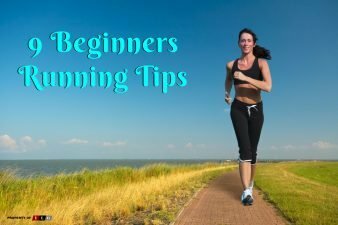 Runners can benefit from a brief walk to warm-up and also maintain shoes that are in good condition. Changing directions and running on softer surfaces is also helpful. Low back strains, also known as lumbar strains, are the most common causes of low back pain. Due to the weight bearing function of the lower back and the need to twist and bend, the back takes a lot of stress. When inflammation or injury occurs it causes the muscle fibers to become abnormally stretched and even tear. The first indication that something is wrong can be a quick sharp twinge during your workout or later during a routine activity that would normally cause you no pain. Prevention: Learning how to stay safe involves finding your neutral back. This can be done when you lie on your back and bend your knees with both feet firmly flat on the floor. In this position, your spine should also touch flat on the floor, both under your neck and lower back. Maintaining this curve during activities allows the curves of your back to take the shock during exercise. If you begin with proper form it will help protect against injury. Do not hesitate to reach out to a qualified trainer for advice. It will be worth the expense to remain healthy. shoulders exercise injuries and how your recovery is working for you. Our readers all are looking for information on what others are trying.